FILE PHOTO: With U.S. Ambassador to the United Nations Nikki Haley at his side (L), U.S. President Donald Trump speaks during a working lunch with ambassadors of countries on the UN Security Council at the White House in Washington, U.S., April 24, 2017. 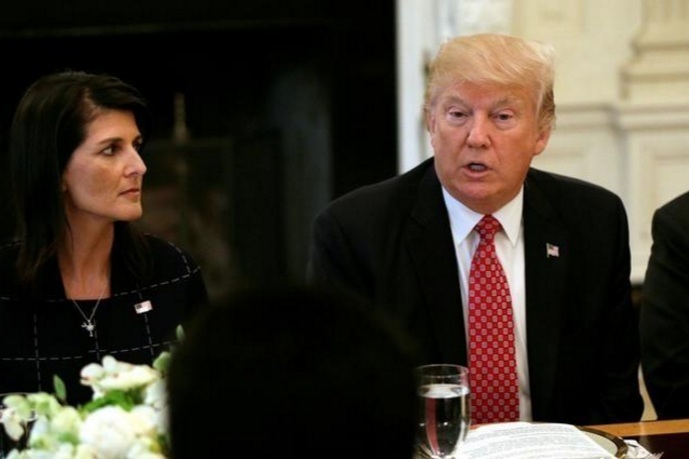 UNITED NATIONS - When President Donald Trump takes the world stage at the United Nations for the first time this week, he will share the spotlight with his envoy Nikki Haley, who has emerged as the surprising public face of U.S. foreign policy. Haley dismisses speculation she could replace Tillerson, the country’s top diplomat, who has at times publicly differed with Trump during the president’s eight months in the White House.